For the first ten years of her life, Jana was a simple Czech girl, her days run with grey precision by the Czechoslovakian State Security. Then the raven-haired girl Zorka appeared. Jana, now an interpreter in Paris for a Czech medical supply company, hasn't seen Zorka in a decade. Aimée is in Paris too, living under the shadow of a menacing blue cloud, mourning the death of her wife Dominique. Meanwhile, in the ether of a lesbian internet chatroom, a teenager from the American Midwest who goes by the moniker 0_hotgirlAmy_0 plans to rescue Dominxxika_N39, a rural Czech housewife, from her tyrannical husband, a hospital bed salesmen. 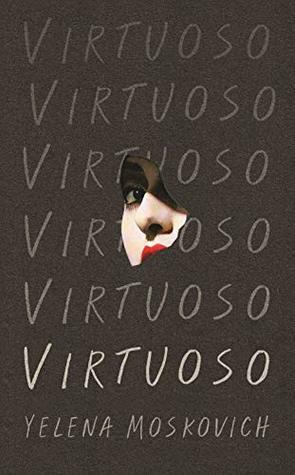 Written with the dramatic tension of Euripidean tragedy and the dreamlike quality of a David Lynch film, Virtuoso is an audacious, mesmerising novel of grief, revolt, identity and first loves and last loves. Virtuoso was certainly a fascinating piece of literature. It had a dreamlike quality that pulled me in and kept me turning the pages. The prose was beautiful and lyrical, and I loved the raw yet emotional portrayal of the women in the cast. This is a novel that requires concentration as we weave from one story to the next and back again, but I enjoyed piecing everything together. This is a book with plenty to say that will leave you pondering for days after you close the final page. That said, I did struggle with the ending. I had expected things to come together a little more cohesively than they did, and I still had a lot of unanswered questions, especially regarding the chatroom romance. Still, it was certainly an exciting introduction to a new-to-me author, and I hope to read more of Yelena Moskovich's work in the future.